The Insider’s Guide to Finding Your Niche and Launching Your Mobile Marketing Strategy! Mobile technology is growing at massive rates with adoption 20 times faster than the Internet. In fact more people own and use a mobile phone than use the Internet. Don’t miss out! Learn how to identify where you fit as an entrepreneur or business owner so you can take action! 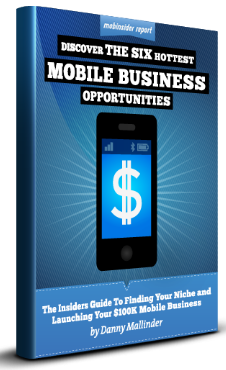 The following free report walks you through the Six Hottest Mobile Business Opportunities, informs you of the technology involved, who is likely to succeed with next steps, and tips in each section. Make Some Important Decisions: What to Do Next?